Photo by Harry How/Getty ImagesUFC lightweight world champion Khabib Nurmagomedov is escorted out of the T-Mobile Arena. Three of Khabib Nurmagomedov’s “guys” have been arrested, according to UFC boss Dana White. The arrests have reportedly been made because of a post-fight brawl that broke out after Nurmagomedov’s statement-making victory over Conor McGregor at UFC 229. Nurmagomedov mounted the fence after submitting McGregor, and seemingly charged at one of the Irishman’s friends, Dillon Danis, who was cageside at the time. UFC boss Dana White has said that three arrests have been made after a post-fight brawl marred Khabib Nurmagomedov’s statement-making victory over Conor McGregor. Nurmagomedov was in complete control in his UFC 229 bout against McGregor at the T-Mobile Arena in Las Vegas on Saturday, October 6, and submitted the Irishman with a tight neck crank in the fourth round. Nurmagomedov, though, lost control immediately after McGregor tapped. The Russian mounted the fence of the octagon and seemingly charged at one of McGregor’s cageside friends, Dillon Danis, according to ESPN journalist Chamatkar Sandhu. 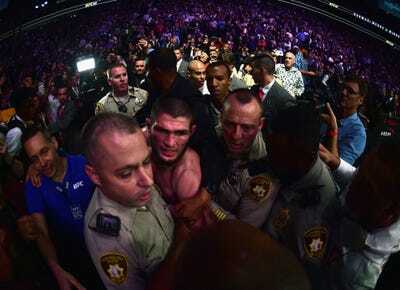 A member of Nurmagomedov’s team was then seen on video attacking McGregor in the cage, as chaos ensued. As Dana White put it, "all hell broke loose" tonight at #UFC229 as a brawl erupted following Khabib Nurmagomedov's win over Conor McGregor.???? UFC boss Dana White refused to give Nurmagomedov his UFC lightweight championship title after his win, and the fighter was escorted out of the arena by Las Vegas metropolitan police. There have already been repercussions, White said. “Three of Khabib’s guys have been arrested and are on the way to jail now,” White said. Prominent MMA journalist Ariel Helwani, of ESPN, posted a video on Twitter of what looked like one of the arrests. According to MMAJunkie.com and USA Today reporter Mike Bohn, White later said that McGregor refused to press charges so the three people arrested have reportedly been released by police. Dana White says Conor McGregor has REFUSED to press charges over tonight's incident. The 3 people arrested on Khabib's side have been released by police.